Ten years ago today, Kate and I were in the midst of our favorite trip. Ever. A rock sculpture in downtown Shanghai. 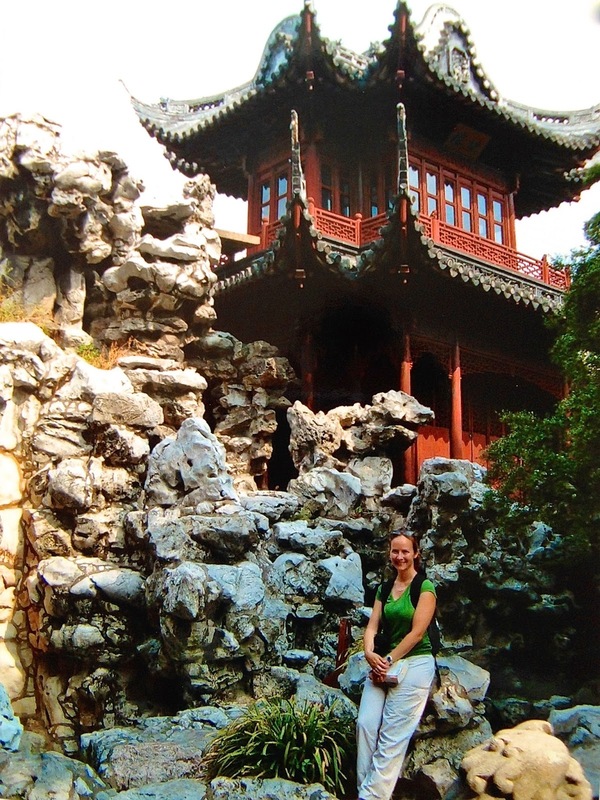 On August 14, 2004, our itinerary took us to Shanghai, China. We had arrived in China a couple of weeks prior, spending a few days in Hong Kong. Over the course of a month, we zigzagged and hopscotched north-ish. A few nights in Yangshuo amidst the karst mountains, a night in massive and industrial Chongqing, a couple of nights on a river cruise floating down the Yangtze River, and so on. Rickety buses, puddle jump flights, cattle car train rides. Shanghai. Xi'an. Pingyao. Beijing. I have mentioned before that our travels in China were a perspective altering time for me. It wasn't a matter of being my first overseas trip, nor a first long trip, nor even experiencing a markedly different culture. I had crossed oceans before, spent multiple weeks abroad. But traveling in China made me take stock of how I lived in America; how much relative affluence I enjoyed; the advantages of education and opportunity; material ease; environmental stability; comparative freedom versus repression and censorship; atomistic society contrasted with familial and community-based society. It also helped me realize that, hey, even in the midst of this foreign culture — where I can't speak or read the language, been advised not to drink any unbottled water, can't read websites like the New York Times because they've been blocked by the government, etc. — I was fine. Happy. Thriving. The thrill of discovery vastly outranked any confusion or annoyance or inconvenience. Most folks were willing to help, so long as I smiled and said a few rudimentary Mandarin words or phrases. In China, people regularly wanted to take pictures of Kate. Often, they wanted pictures of Kate with their kids. Even in a mostly-Westernized metropolis like Shanghai, it was an event for many folks to encounter Caucasians wandering the city. During the trip, it dawned on me that not only could I feel comfortable traveling anywhere in the world. I could live there. Which is not to say I immediately decided I must move overseas. No lightning bolt struck. I wasn't suddenly itching to become an expat. The trip was, however, the start of a process reevaluating where we lived. How we lived. What would make our lives more interesting? More enriched? Would we ever contemplate living outside the U.S.? Why? Where? Have you ever had a trip like this? One which challenged you? Not just pushed your boundaries but reshaped them? Our trip to China literally and figuratively broadened my horizons. I can't draw a straight line from our month in China to ending up as expats in Scotland. Not even a crooked line. Maybe, possibly, a dotted one. But ten years ago, something shifted. Profoundly. Thanks. That China trip is a definite touchstone for all my other travels.